Today’s Feature Friday spotlights one of our retail partners in West Virginia: The Greenbrier. An award-winning luxury resort and National Historic Landmark, The Greenbrier opened in 1778. “America’s Resort” is located amid the mountains in White Sulphur Springs. The Greenbrier offers numerous amenities, including golf, fine dining, designer boutiques, and a world-renowned mineral spa. The resort is a popular destination for U.S. Presidents, international royalty, and celebrities. White Sulphur Springs is located in southeastern West Virginia. The small city is known as the original home of golf in the United States. Oakhurst Links, a 9-hole course in White Sulphur Springs, is the oldest organized golf club in the country. Golf remains a popular sport in White Sulphur Springs. The Greenbrier hosts the Greenbrier Classic, an annual PGA Tour tournament played on The Old White TPC. Today’s Feature Friday spotlights one of our retail partners in Texas: M. Wiesenthal. Michael Wiesenthal, the store’s namesake, opened the shop in Bellaire in 2012. The Wiesenthal name is synonymous with fine menswear in the Houston area. Michael’s father, Harold, owned a successful men’s store – Harold’s in The Heights – for more than 60 years. M. Wiesenthal Men’s Collection offers lifestyle apparel for business, casual, and sportswear. Today’s Feature Friday spotlights one of our retail partners in Georgia: A.D. Mathis. The store opened in Gainesville in 1992. With over 20 years in business, A.D. Mathis is the premier menswear destination in Gainesville. The shop specializes in custom clothing and carries an impressive selection of popular sportswear. Today’s Feature Friday spotlights one of our retail partners in Louisiana: Vita. Located in Metairie, the store opened in 2013. Vita is Old Metairie’s only lifestyle boutique. The shop carries a wide selection of apparel and accessories for men and women. Vita also offers art, decor, and home furnishings. Metairie is located in the New Orleans Metropolitan Area. Prior to urbanization, Metairie was a farming community developed by French settlers. “Metairie” is the French term for sharecropping. Metairie has been home to numerous popular culture figures, including Ellen DeGeneres and Reese Witherspoon. Earlier this year, we teamed up with our friends at Kentucky for Kentucky to make some special socks that celebrated two Kentucky treasures — bourbon making and horse racing. These socks were a hit, so we thought “why not make some more Kentucky-inspired socks?” We’re excited to announce the release of our newest collaboration with Kentucky for Kentucky. This new collaboration includes two unique sock styles: “Lucky Horse” and “Clucking Awesome“. Kentucky is known for its thoroughbreds. Last month one of those bluegrass-bred thoroughbreds – American Pharoah – made history by winning the first Triple Crown in nearly 40 years. Winning the Triple Crown takes a lot of talent and, maybe, a little luck. 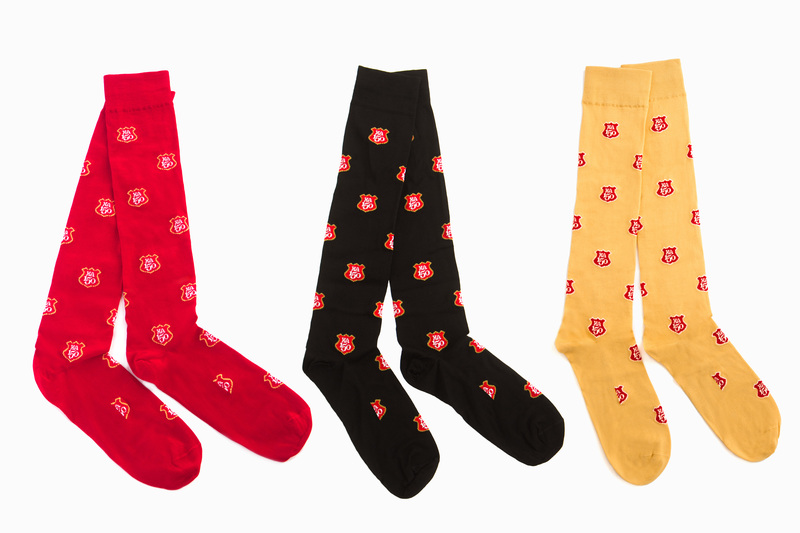 The horse and horseshoe patterned “Lucky Horse” socks celebrate both. Next time you’re traveling abroad, ask a local what they know about Kentucky. Odds are, they will bring up KFC. The Kentucky-based food-chain can be found all over the world. The “Clucking Awesome” socks honor one of Kentucky’s most famous “inventions” (fried chicken). Don’t miss out on your chance to get these fun socks. We’re betting they’ll move as fast as a thoroughbred and disappear as quickly as a bucket full of fried chicken.